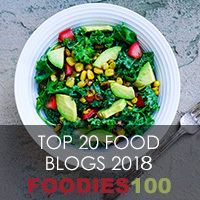 I love pasta dishes and I have a few that I fall back on time and again which rely on mainly store cupboard ingredients, great for those days when you haven’t had time to plan anything! 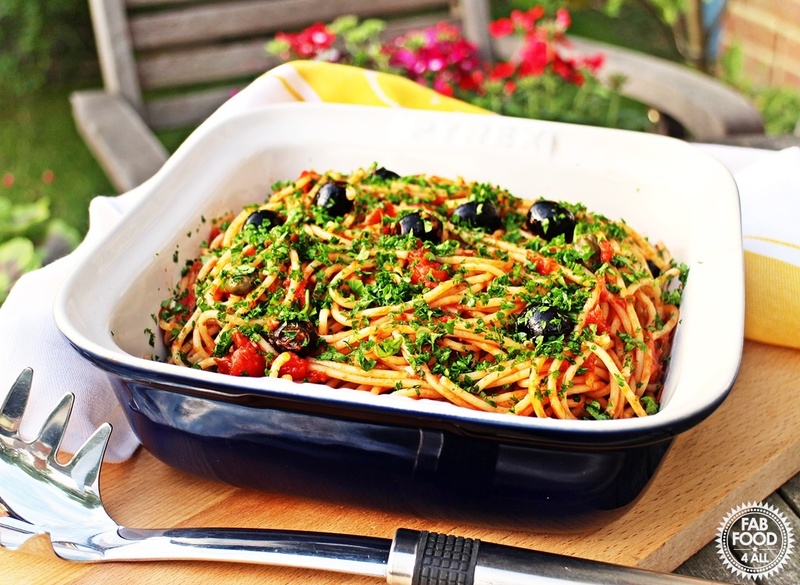 So when Bertolli asked if I’d like to recreate one of their many fabulous pasta dishes I made a beeline for this Italian Tomato Spaghetti which is so quick and easy and makes great use of store cupboard ingredients! This puttanesca style tomato sauce is packed full of anchovies, olives, capers and garlic for a really authentic Italian flavour. 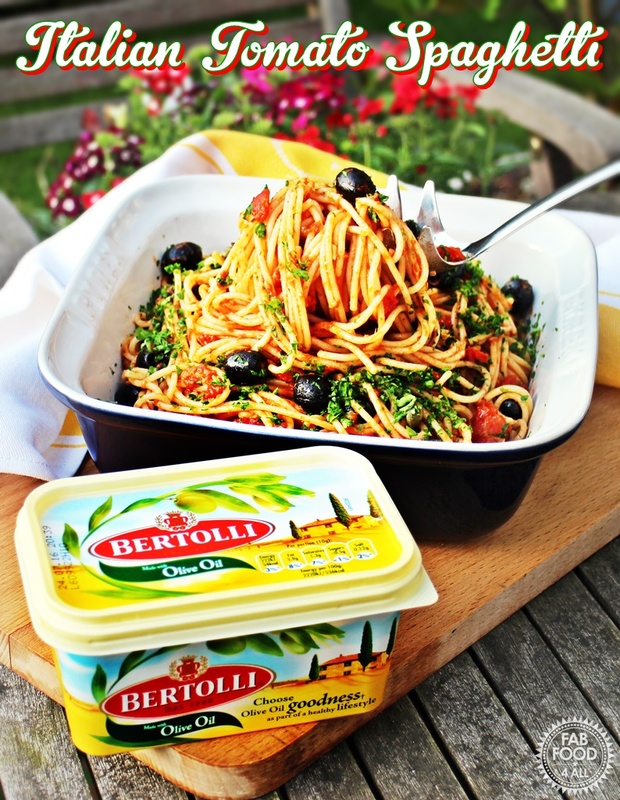 The recipe uses Bertolli Original Spread which is made with olive oil and it gives a lovely creaminess to the flavour. Did you know Bertolli contains 74% less saturated fat than butter? My family loved this Italian Tomato Spaghetti and the only thing I added to it was a dash of black pepper as we do like our pepper but if you don’t then you could leave it out! I have to say I have been a late comer to the caper and anchovy party but now I can’t have enough of them! I will definitely be making this dish regularly as it is so simple to make and uses ingredients I usually have to hand. Do check out the Bertolli pasta recipe page as there are so many other quick and delicious meal ideas! 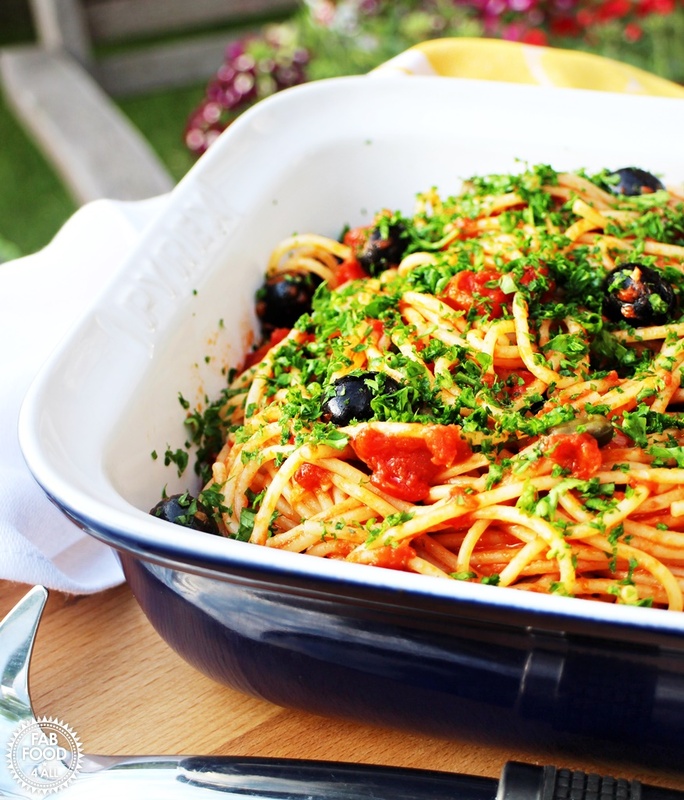 Italian Tomato Spaghetti is packed full of anchovies, capers, olives and garlic for a truly authentic puttanesca style sauce, so quick and easy, you'll be making it time and again! Heat the Bertolli spread in a saucepan over a medium heat and sauté the garlic and anchovies until soft. Add capers, olives, tomatoes and freshly ground pepper and simmer for 15-20 minutes. Meanwhile cook the spaghetti or pasta according to their instructions. Drain. Add the spaghetti to the sauce and toss well together. What’s your go to pasta dish? Do tell me in the comments below! 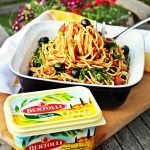 For more Bertolli pasta inspiration you can check how fellow bloggers got on with these recipes! NB: This is a commissioned post for Bertolli and all opinions are my own. A winning receipt. tasty dish which will use some of the ingredients that I have already in the stock cupboard. Ooo that looks really good! We always have a pasta dish at least once a week. And any leftovers are delicious cold the next day! This sounds delicious – wasn’t so sure about the anchovies until I read one of the other comments that says they take on a nutty flavour. Thanks so much for linking to my recipe blog post for Gennaro’s mushroom pasta dish! Your spaghetti looks amazing, I want to try this tonight! looks delicious I could live on pasta dishes! I made this and my sister, who claims she hates anchovies, ate it and loved it. She didnt believe me when i told her it had anchovies. In the oil cooked throigh, they take on a slightly nutty flavor. 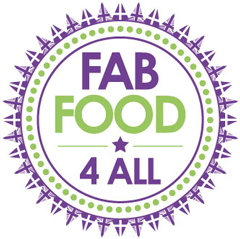 Fab Dsisto so glad you like it and maybe she’ll try some more anchovy dishes, now, I never used to like them either! Oh gosh this looks like the perfect comfort food! Love that you’ve added olives too (I’m an olive fan). Bertolli is my go-to spread now – I love it on a slice of fresh bread!